At FitSmallBusiness.com our mission is to deliver the best answer to people’s questions. Our writers are experts in their fields and thoroughly research the topics and companies they cover. The editorial reviews and recommendations you read on our site are the result of the quantitative and qualitative assessments of our editorial team. Visit our disclaimer page to see how we make money and continue to fund the highest quality content for small business owners. 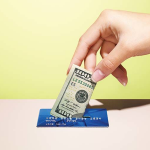 Bank of America, Capital One, Chase, American Express are our credit card partners. We receive compensation when you click on a link on this page. The CitiBusiness® / AAdvantage® Platinum Select® World Mastercard® is a must-have card for frequent American Airlines flyers. It offers free checked bags and priority boarding, something most other credit cards don’t offer. The card includes a 70,000-mile introductory offer and two times the miles on American Airlines purchases. The ongoing APR is as low as 17.99%. The best business credit cards for travel pay up to five times the points or miles on at least one bonus category, offer introductory rewards worth at least $500 and provide benefits like airport lounge access, expedited airport security screening, free checked bags, and annual travel credits. 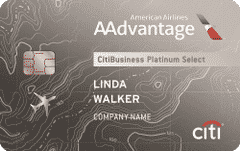 The Citi AAdvantage Card offers an excellent sign-up bonus and solid benefits. We give it four out of five stars. The CitiBusiness® / AAdvantage® Platinum Select® World Mastercard® offers frequent American Airlines customers solid benefits that could save them money like with free checked bags. It also offers an introductory bonus that could be worth more than $700 in travel. However, the rewards aren’t as good as some of the best small business credit cards offer like the American Express Business Platinum Card® card, which pays five times the points on flights. We weigh introductory rewards, ongoing rewards and additional benefits heaviest when grading business travel rewards credit cards. The CitiBusiness/AAdvantage credit card offers top introductory rewards and excellent benefits, like a $99 companion pass. But its two times the miles on American Airlines flight purchases isn’t quite as good as other cards offer like the Chase Ink Business Preferred℠ (3 miles per $1). When grading travel rewards business credit cards like the CitiBusiness® / AAdvantage® Platinum Select® World Mastercard®, we weight ongoing rewards, introductory rewards, and additional features heaviest. We also consider the card’s annual fee and its introductory and ongoing APRs. The only piece that is missing from this card is an introductory APR period. Based on our five-star rating system where 20 points equals one star, the CitiBusiness® / AAdvantage® Platinum Select® World Mastercard® would need to improve it’s ongoing rewards and offer a 0% APR period to earn the next half star. In cases where cards receive perfect scores in most categories, we may award bonus points to boost the card’s rating. Despite the strong introductory rewards, this grade is appropriate because the CitiBusiness® / AAdvantage® Platinum Select® World Mastercard® lacks a 0% APR period and can improve its ongoing rewards. Other travel rewards business credit cards offer more substantial rewards, such as the American Express Business Platinum Card® (5x points on travel-related purchases). The CitiBusiness® / AAdvantage® Platinum Select® World Mastercard® is best for business owners who frequently or exclusively use American Airlines for their business travel. Perks like free checked luggage, preferred boarding and a $99 companion pass after you spend $30,000 in an account year make this card valuable for AA loyalists, even if the travel rewards are slightly lower than on other cards. This CitiBusiness card comes with no introductory 0% APR on purchases or balance transfers, which is not unusual for a business travel rewards credit card. CitiBusiness® / AAdvantage® Platinum Select® World Mastercard® rates are about average for this type of card but are about four percentage points higher than what Bank of America® Business Advantage Travel Rewards Mastercard® charges. Penalty APR: Up to 29.99% and may be applied indefinitely if you make a late payment or make a payment that is returned. The $99 annual fee ― waived the first year ― is nearly identical to the annual fee assessed on the Capital One Spark Miles ― $95, waived the first year ― and the United℠ Explorer Business Card ― $95, waived the first year. It’s significantly less than you’ll pay with the American Express Business Platinum Card® ― at $450 ― or the American Express® Business Gold Card ― at $295. Search for a cash back business credit card if you want rewards without an annual fee. Your payment due date is at least 23 days after the close of the business cycle (when you receive your bill). 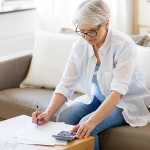 Pay your balance in full by the due date to avoid interest charges. If you are charged interest, you’ll pay no less than 50 cents. The CitiBusiness® / AAdvantage® Platinum Select® World Mastercard® offers its best rewards for spending on American Airlines flights, car rentals, gas stations, and telecommunications, cable, and satellite provider purchases. It also offers introductory rewards that could be worth at least $700 when used to book travel. If you’re just getting started, although this card may not be right for you. Consider some of the best business credit cards for startups. You will earn 70,000 American Airlines AAdvantage bonus miles after you spend $4,000 within the first four months after account opening. Those points could be worth $700 or more when used to book travel. That’s a slightly lower return than you’ll get from another travel rewards credit card, the Chase Ink Business Preferred℠, which pays 80,000 points worth up to $1,000 in travel rewards. Other business travel credit cards offer higher returns on flight purchases, including the American Express Business Platinum Card® ― five times the miles ― and the Chase Ink Business Preferred℠ ― three times the miles. Few business credit cards offer rewards on cable and satellite service, so the CitiBusiness/AAdvantage credit card is a good choice for telecommunications payments. Before you decide how to redeem your rewards, first learn how to maximize rewards. Citi and American Airlines offer several free or reduced-fee travel perks and complementary insurance as part of this card’s benefits packages, including free checked bags and car rental insurance. Only credit cards offered by specific airlines come with free checked baggage benefits. Check one bag for free for you and up to four companions traveling with you to domestic itineraries if they are listed on the same reservation. The benefit does not apply to overweight or oversized bags. Checked bag fees typically start at $30, so this benefit could be worth up to $150 per flight. Business travel credit cards not affiliated with a particular airline like the American Express Business Platinum Card® don’t offer this benefit. You and up to four traveling companions will be able to board once priority boarding is complete but before the rest of economy boards. Your boarding pass will show Group 5. This benefit is similar to what the Gold Delta SkyMiles® Business Credit Card from American Express offers. Travel rewards credit cards not affiliated with an airline like the American Express® Business Gold Card do not offer boarding benefits. Earn one $99 domestic economy fare plus $21.60 to $43.40 in government taxes and fees after you make at least $30,000 in eligible purchases each 12-month period prior to your card anniversary date. The companion certificate is valid on a round-trip flight within the lower 48 states in which the primary cardholder purchases a main cabin fare ticket. The Southwest Rapid Rewards® Premier Business Credit Card offers a similar perk. Receive a 25% discount on in-flight food, beverage and Wi-Fi purchases you make with your CitiBusiness credit card. The Platinum Delta SkyMiles® Business Credit Card from American Express offers a 20% discount on food and beverage purchases. When you rent a car using your CitiBusiness card, you’re covered in case of accident or theft on all rentals made worldwide. Coverage is primary, which means you won’t need to use your personal auto insurance or accept insurance offered by the rental agency. Coverage is capped at $50,000. Trucks, sport-utility vehicles, vans, recreational vehicles, antique vehicles and any vehicle with fewer than four wheels will not be covered by this insurance. Credit cards that offer rental car insurance generally include exclusions similar to these. Other business travel rewards credit cards may offer higher coverage limits, but more restrictions on coverage. 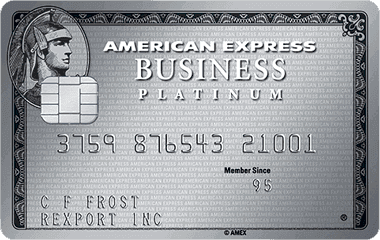 The American Express Business Platinum Card®, for example, caps coverage at $75,000 but also doesn’t cover rentals made in certain countries, including Australia, Italy, and New Zealand. Citi may repair or reimburse for items purchased with your CitiBusiness card that are damaged or stolen within 90 days of purchase. Coverage is limited to $10,000 per item, up to $50,000 per year per account. Lost items and items “left in public sight” are not covered. Business travel rewards credit cards that offer this coverage typically limit coverage to either 90 or 120 days after purchase. The CitiBusiness/AAdvantage credit card offers shorter coverage than the Chase Ink Business Preferred℠ but the same length of coverage as the Capital One® Spark® Miles card. Exclusions here are common across small business credit cards. Citi will double the manufacturer’s warranty up to an additional 12 months from the expiration of warranties of 60 months or less. An item with a six-month warranty would be backed for an additional six months, for example. The issuer will replace the item or reimburse you up to the amount charged on your Citi card up to $10,000. The extended warranty protection is weaker than some other travel rewards business credit cards offer, including the American Express® Business Gold card, which offers one additional year of warranty service on purchases with warranties of five years or less. Citi will provide up to $1 million of coverage if you die or lose a limb, sight, speech or hearing in a plane, train, ferry or cruise ship accident paid for with your business Citi AAdvantage Card. Citi will pay out the maximum coverage only in the event of death. Injuries are eligible for $250,000 to $500,000 in coverage. Injuries or death that occur while boarding or exiting a plane, train, ferry or cruise ship “while engaging in extreme activities” (the issuer doesn’t define “extreme activities”). 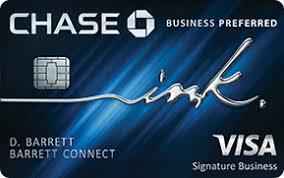 Citi offers double the loss-of-life benefit that comes with Chase Ink Business Preferred℠. However, that card also offers a 24-hour death benefit if you or a covered traveler die any time during the duration of a trip of 30 days or less in which you booked airfare for your travel using your card. That coverage is limited to $100,000. Mastercard will provide travel, emergency, medical and legal assistance 24 hours a day to the cardholder, cardholder’s spouse, or dependent child under the age of 19 ― up to 25 years of age in the case of a dependent full-time college student. Like with most small business credit cards, this is mostly a concierge service. In most cases, the cardholder is responsible for the cost of any assistance. This is fairly standard help for credit cards that offer travel and emergency assistance. Premium business travel rewards credit cards, like the American Express Business Platinum Card®, may offer a higher level of service. Use the card’s Premium Global Assist Hotline when you fall ill, and the issuer may provide a medical evacuation at no cost to the card member or covered family member. You can request employee credit cards at the time of application. All employee cards earn rewards for the main cardholder’s account and come with no annual fee. Nearly all issuers, excluding American Express, offer employee cards free of charge even if the primary card comes with an annual fee. The Citi AAdvantage Card is missing some perks that other travel rewards business credit cards offer. The American Express Business Platinum Card®, for example, offers free access to more than 1,000 airport lounges worldwide and a $200 annual statement credit toward air travel expenses. The rewards on air travel are also lower than cards like the Chase Ink Business Preferred℠ offer ― three times the points per $1 spent. We scoured the web for CitiBusiness® / AAdvantage® Platinum Select® World Mastercard® reviews, which are generally positive. Users love the large introductory reward and the first-year-free annual fee. For travel rewards enthusiasts, the card’s two times the miles per $1 spent on American Airlines’ flights is seen as a slight negative. You can apply online for the CitiBusiness® / AAdvantage® Platinum Select® World Mastercard® online. Fill out a basic application containing both business and personal information, and you could be approved instantly. Once you’re approved, you’ll receive your card in the mail within seven to 10 days. Check your application status on Citi’s website. Before you apply, learn how to get a credit card. Login to your CitiBusiness® / AAdvantage® Platinum Select® World Mastercard® account on Citi’s website by providing your user ID and password. You can also contact customer service for Citi small business credit cards at 866-422-3091. Some travel rewards business credit cards may offer higher rewards on airfare — and opportunities to earn rewards on more than just American Airlines’ flights. If you’re not a loyalist to this air carrier, you may want to consider a travel card that offers higher rewards or better perks. Mike Cetera is a staff writer at FitSmallBusiness, specializing in small business credit cards and bank accounts. Prior to joining FSB, Mike spent nearly a decade as a financial editor and writer, arming businesses and consumers with the right information to make smart choices with their credit cards, bank accounts, and personal loans. Mike holds both a bachelor’s and a master’s degree in journalism. Looking For a Business Card to Fit Your Needs?